The Maori name now used for New Zealand is Aotearoa, ‘Land of the Long White Cloud’, a description of the form of islands glimpsed from the ocean, their mountains obscured by the vapour gathering around their peaks. Cloudland draws on this duality of the solid and insubstantial to address the instability of place and its definitions, the permeability of boundaries and the connections between people and place.The borders of any island nation appear clearly delineated, inked on maps by the sea. However this misleading conflation of the political and natural obscures the historical contingencies of nationhood, the processes of ‘discovery’, colonization and treaties as well as the tectonic shiftings and changing sea levels that stake out the land itself. The political space of New Zealand extends out to a distant boundary, meeting the edge of international waters at a point defined by geospatial coordinates but entirely open to the movements of ocean and its life. Despite its isolation New Zealand’s borders are permeated by flows of finance, power, people and communication. It is in these more ephemeral but materially consequent realms that the maintenance of national space becomes an anxious and uneven enterprise. Founded on long waves of settlement from the Pacific and beyond, Aotearoa New Zealand retains tensions between the indigenous and the imported – on the one hand obsessed with defining identity and maintaining biosecurity, and on the other, free of tariffs and trade restrictions and welcoming of foreign investment. These fluid borders blur the edges and obscure the shape of the nation. Internationally, ideas of ‘New Zealand’ are barely separated from the iconography of geography; the land encapsulated in postcard images of mountains, bush and beaches, fragmented by advertising campaigns, digitally blended cinematographic landscapes, the nostalgic flora and fauna of souvenir t-shirts and homewares. Cloudland takes this iconic New Zealand and extracts its foundational myths of isolation and inventiveness, distance and ingenuity, identifying a place self-consciously located at the edge of the world. Belying this claim to isolation, the works in Cloudland have multiple connections to the global flows of contemporary art, connections exemplified first by experimental film-maker and kinetic sculptor Len Lye. Lye left New Zealand in 1920, spending time in Samoa and Australia before moving to London, and then in the 1940s, to New York. His stated aim was to “compose motion, just as musicians compose sound.” Lye’s is a classic expatriate story of the long-lost son drawn back into a nationalist mythology, with a pedigree naming many major figures in twentieth century art. Communicating the physicality of its production, Free Radicals choreographs motion. Inscribed with the materiality of Lye’s direct film processes, the visceral appeal of its forms are barely contained by the frame. The exclusions and exclusions of the camera frame are also important to Alex Monteith’s Composition for farmer, three dogs and 120 sheep for four-channel video installation. Informed by her experiences as a former farm worker, Monteith directs the movement of a mob of sheep across the multiple frames of her recording cameras. Composition for farmer… engages with the rural craft of mustering, a practice transformed into a sport for televised entertainment in the 1970s. Once screened on primetime, competition mustering is a performative reworking of the global flows of trade in which New Zealand’s links to empire, once forged by meat, wool and milk were extended into domestic entertainment and touristic imaginaries. This notion of how realpolitik reforms geographies and imaginations is also examined in Stella Brennan’s South Pacific. The video’s text and grainy pictures explore how Japanese empire-building during the Second World War shifted global conceptions of the Pacific, its waters and islands. Submerged forms emerge from the dark, revealed by ultrasound, sonar and radar. Radio signals, like sound waves, are uncontained by political borders, bouncing between ocean and ionosphere, but they are also produced by localized conditions of transmission. Bruce Russell, Adam Willetts, and PSN Electronic’s works in Etherradio are highly place-specific, with a sound and texture imbued by the particular wavelengths and content of the frequency bands they tap into and the atmospheric conditions and geographical features that shape their signals. Radio is not used in these pieces for its intentional communications content, rather it is a constant and pervasive presence that these artists intercept, make audible and sculpt into new forms. Although the particularity of radio signals – the structures of ownership and control that determine their use – is shaped by political and economic forces, the ‘simple’ presence of radio signals is still experienced as a quasi-mystical force, an ether from which unearthly and un-human sounds can be drawn. Radio transmission transformed global communications, combining the intimacy of the voice with the collapsing of distance. More recent technologies enact desires for immediacy rather than broadcast. In Listening Heads Kentaro Yamada emphasises the anthropomorphism of technology, literalising the interface: his heads smile, yawn or frown in response to the sound of speech. But the connection is somehow dissatisfying; the work’s interlocutors are stranded within a facsimile of communication. A more sinister monologue, et al.’s the shape of things interrogates the exertion of control. Corollary to any sustaining myth of isolation are the politics of inclusion and exclusion, the defining of territory and the policing of boundaries. et al. forms these mechanisms into a bureaucratic tableau. Movement is no longer choreography or conversation, but stasis, instruction and potential terror. It is a comfortable fiction to say that we know precisely where one thing begins and another ends. Clouds, like screens, both reveal and obscure. As technologies are used to distance and control, and territories are closed off, and subject to surveillance, this clouding of space becomes another form of isolation. In its awareness of the contingencies of distance and proximity, Cloudland reflects on place and the flows that connect us, evoking an island location both seen and unseen, ethereal and material. 16 mm film, b&w, 4 minutes, music by the Bagirmi tribe of Africa, courtesy the Len Lye Foundation, Govett-Brewster Art Gallery, New Plymouth. Granddaddy of New Zealand experimental media practice, Len Lye (1901-1980) is known for his vivid and entrancing films – often made by directly scratching, painting and printing onto filmstock – and his kinetic sculptures that boom, flip and crash. Free Radicals repurposes and reimagines film through movement hand-scratched onto black film leader. Lightning-fashes, scribbles and stripes synchronise to drumming – a homage to Yoruba, god of thunder. The music was printed as an optical soundtrack, the waveforms of which then feed back into Lye’s animation. The film retains a sense of process, of Lye’s fascination with doodling and unconcious mark-making as a way to access deeply held, pre-rational understanding. Scratching the emulsion back to the clear film beneath, the drawn marks of the hand are clearly visible. Lye’s studied mix of accident and control sends scribbles rotating and stripes dancing across the frame. Forms pulse and twist in a kinesthetic meld of image and sound. Free Radicals suggests molecular interactions; the film’s black void could be interatomic or interstellar space. Single channel video, sound, 10 minutes, courtesy the artist and Starkwhite. Stella Brennan’s South Pacific made in collaboration with radiologist Dr David Perry, examines the links between sonar, radar and ultrasound; technologies for making images from non-visual sources. Playing with relations between the visual, aural and textual, the work explores how the Second World War changed the perception of oceanic space and the conflict’s legacy in the region. In 1954 American radiologist D. Howry and his team created live ultrasound images using declassified material from the gun turret of a B29 Superfortress – planes which, at the close of the Second World War would leave Pacific island airfields in their hundreds to bomb the Japanese mainland. 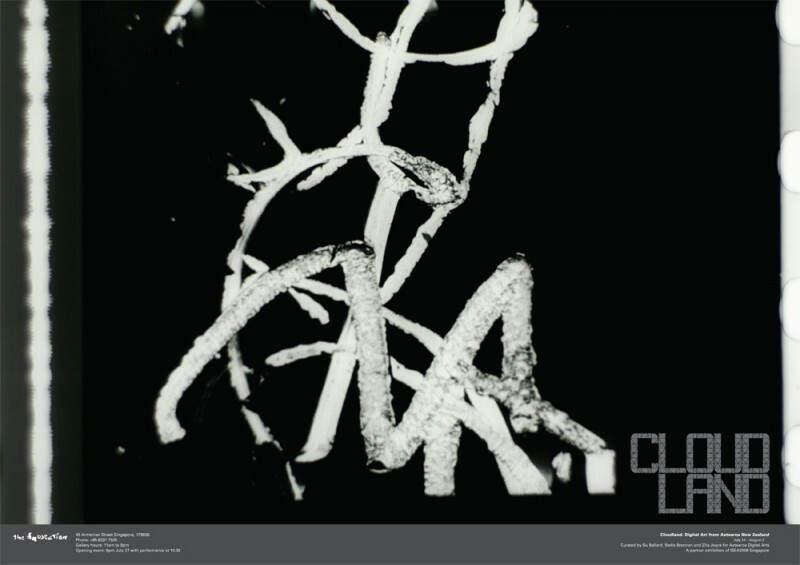 Reviving a technique of this early experimental ultrasound, which required the patient to be immersed in water, Brennan forms images exploring the interface between war, technology and perception. South Pacific recalls stories of tropical lagoons littered with rusting ordnance and coral islands flattened for runway, a vast ocean is glimpsed by radar, video and ultrasound. Current work of the et al. collective is best summarised as a kind of archiving of societal events and issues, aspects of which are explored through immersive installation environments that engage with issues of global political inter- (or hyper-) activity, fundamentalisms, and belief systems. The collective’s practice evokes the closed and secretive dimensions of global communication, information, and transport networks, and to this end the social meaning of things deploys tools such as synthesised speech, political sound bites and aleatoric scripting, reconstructed Google Earth visuals and advertising hoardings and noticeboards. et al.’s scenario both informs and excludes the viewer. the social meaning of things is embedded in the political flows that create, maintain, and permeate nations and borders. Alex Monteith’s Composition for farmer… tweaks an archetype of agrarian New Zealand, so often described as a nation of 40 million sheep and 4 million people. In the crisp air of a Taranaki farm, Lloyd Bishop, a champion New Zealand dog triallist, expertly choreographs three dogs and 120 sheep across the viewfinders of Monteith’s four simultaneously recording video cameras. The once-primetime television staple of sheepdog trialling, where farmers and their dogs compete to usher a mob of sheep through a course and into a pen in record time, becomes in Monteith’s video installation a pattern of animal and human bodies. There is nostalgia for an imagined rustic innocence, contradicted by the muddy specificity and the fantastic pointlessness of this choreography. Formally, the work draws a relationship between the rigid framing of the camera lens and the pegged arenas the sheep move between. This work evokes nationalist, multi-screen hymns like This is New Zealand, a celebration of culture and landscape that screened at the 1970 World’s Fair in Osaka. Kentaro Yamada’s Listening Heads highlights the nuances of communication made from the non-linguistic elements that shape conversation. Speaking into one of the microphones hanging in front of these large-scale video portraits provokes an emotive but silent expression from the sitters – they frown, fall asleep, look bored, or intent. The viewer engages in a phantasmic conversation, seeking by habit an approving or appropriate look from faces that appear open and responsive but simply form a thin veneer over a computer interface. The resulting monologue can feel reassuringly complete, an illusion of interaction framed by intangible presence. Sometimes the spoken input and the video response coincide, but other times the head’s reply leaves the viewer with the sense of a communication breakdown. Listening Heads plays with our human perception of the face as privileged object. The illusion that the heads listen and respond turns the portraits into a kind of mirror, returning our gaze. By clothing his hardware and software in his friends’ visages Yamada constructs a kind of wordless Turing test. 3 x portable sound players with headphones. Total running time approx 50 minutes. Sound artists Bruce Russell, Adam Willetts, and PSN Electronic (Peter Stapleton, Su Ballard, and Nathan Thompson) use old and new radio technologies in ways that reveal both the richness of radio as a material of media art, and the density of New Zealand’s unseen radio environment. These three works were recorded in the South Island in June and July 2008. Through the interaction of radio waves, atmosphere, and topography they are infused with the winter storms of the Southern Pacific, the volcanic hills and harbours of Port Lyttelton, Port Chalmers and the reclaimed swampland around Christchurch’s Avon River. Bruce Russell: Electro-magnetic Feedback Study #1 (Strange House in the Snow). Recorded in Lyttelton during a snowstorm, this piece was created with the audio produced by an electromagnetic feedback loop produced by a roughly wound coil of galvanised steel wire, connected to a Tivoli Model 1 radio through the external aerial socket. An audio line out was taken from the Tivoli to the #1 and #2 inputs of Bruce’s vintage Concord Contessa guitar amplifier. The coil was then placed around the speaker magnet in the rear of the amplifier. The radio was tuned to the so-called ‘X-band’, the frequencies above the AM broadcast radio band in New Zealand, used for radio-location and navigation. Electronic samples, Korg and shortwave radio. In the Teleporter series of works PSN Electronic explore the landscape of electricity and broadcast, constructing new sound environments by reconfiguring afterimages of recordings and transmissions. The works are inspired by the Voyager discoveries on Mars, by remote core samples and images dissolved into thin strands of data transmitted back to Earth, information delayed and filtered through transmission and reception. From the less distant locale of Port Chalmers, PSN Electronic engage a process of dissolution and reconstruction, weaving radio transmissions and field recordings into a new kind of landscape. Teleporter 1 explores unknown environments that melt on examination. Electrosmog Lightning Ride is an improvised sound work created using walkie-talkies, Wii Remotes and an electrosmog detector to produce complex patterns of gesturally-controlled radio interference, feedback, and live sampling. This tactile and physical approach to electronic improvisation incorporates the wireless space and electrosmog of these instruments as both method of control and as audible output. Adam emphasises the presence and position of the body, locating it in electromagnetic space and revelling in the magic of the ether. Live performance by PSN Electronic and Adam Willetts, The Substation Theatre, 10:30pm, July 27 2008. In performance Adam Willetts and PSN Electronic create improvised sound works that engage with the particularities of the Singaporean radioscape – shaped by a very different combination of atmospheric, political and geographic conditions than New Zealand’s. Tearing up the ether and playing with the wreckage, Adam Willetts presents a live performance using a homemade analog synthesizer along with the same methodologies used to realise Electrosmog Lightning Ride. In performance, the dynamic and physical nature of Adam’s practice is foregrounded, creating a live experience that is as visually engaging as it is sonically powerful. In this performance drawing on the Teleporter explorations, the group incorporates analogue radio signal, samples, field recordings and antiquated electronics. Teleporter 9b brings this electronic graveyard to life, making audible the sounds of the technologies used as well as the dislocated messages they transmit. In the theatre Nathan and Peter will improvise a sound work using shortwave radios, prepared samples and manipulated source materials. This will be live mixed with Su’s real time transmission of analogue synthesiser frequencies. The performance gives physical presence to electronic transmissions, converting them into live sonic sculptural elements. By using the remote connection of the Internet they make audible the cut and paste aesthetic of packeted information. The performance also includes reprocessed film footage to connect the separate temporal spaces of broadcast. Len Lye is one of New Zealand’s most widely known modernist artists, a filmmaker, painter, kinetic sculptor, writer and theorist who was a leading member of the London and New York avant-garde from the 1930s to the 1970s. Lye’s abstract films pioneered cameraless processes such as direct painting, printing and scratching onto the surface of the emulsion. His work is held in collections including the Whitney Museum, the Art Institute of Chicago and the Museum of Modern Art. His work is overseen by the Len Lye Foundation at the Govett-Brewster Art Gallery in New Plymouth. Stella Brennan is a writer, artist, curator, co-founder of the Aotearoa Digital Arts network, and co-curator of Cloudland. Her works examine technology, obsolescence and utopianism. Recent projects include White Wall/Black Hole, shown at the 2006 Sydney Biennale, a video exploring the 1979 Erebus Disaster (when an Air New Zealand plane crashed into the Antarctic mountain) and Wet Social Sculpture, an installation featuring whale song, psychedelic film and a fully operational spa pool, which was nominated for the 2006 Walters Prize, New Zealand’s most prestigious art award. Her work has been shown in Asia, North America and Europe, and is included in this year’s Liverpool Biennale. Alex Monteith is a new media artist and academic based in Auckland. Her work incorporates sound, performance, photography, film, video, kinetic and network components to explore the politics, freedoms and limits the camera allows. Alex’s technically sophisticated installations have been shown in galleries throughout New Zealand, and her film work has played in festivals around the world. Her projects engage consumer electronics and surveillance technology to explore relationships between performativity, time, technology and place. Kentaro Yamada is a new media artist who was born in Fukuoka, Japan but was raised, and now lives in New Zealand, where he works with graphic and web design and creates video, sound, and interactive installations. Kentaro’s work Tampopo was a finalist for the 2008 Share prize in Turin, Italy, and he has exhibited in Auckland, Texas, Thailand, Melbourne, and on rhizome. The et al. collective’s works integrate multi-media and network techniques with sculptural elements. Video manipulation and programmed temporal and spatial sequencing of audio animates environments redolent of obsolescence, surveillance and anxiety. The collective have exhibited extensively in New Zealand and Europe, they were awarded the 2004 Walters Prize by Robert Storr for their installation restricted access, and represented New Zealand at the 51st Venice Biennale with the fundamental practice. et al.’s 2008 exhibitions include a proposal concerning at the Biennale of Sydney (online) and altruistic studies at Art Unlimited, Art 39 Basel. PSN Electronic was formed in 1999 by three sound artists with a long history in improvised music. Using a variety of methods and equipment, PSN Electronic focus on the sonic potential of broadcast media and short-wave radio. Peter Stapleton has played in numerous ensembles including Flies inside the Sun, Dadama, and Sleep, and legendary New Zealand rock outfit The Terminals. Peter curated the Lines of Flight sound festival from 2000-2006. Co-curator of Cloudland, and a performer with The Sferic Experiment in the early nineties and later with Sleep, Su Ballard writes and lectures on sound, electronic art and media art histories. Su is also a trustee of Aotearoa Digital Arts. Nathan Thompson is a founding member of influential experimental ensemble Sandoz Lab Technicians as well as Sleep and the free rock outfit eye, and has released solo electronic albums under the name Expansion Bay. His video works have been shown in Australia and New Zealand and he performed at the Space and Place Stockholm New Music festival in 2006. Adam Willetts is a musician and artist whose practice shifts casually between hi-tech and handcrafted as he explores the relationships and interfaces between people, technology and popular culture. His use of DIY electronics, radio, computers and game controllers creates dynamic and surprising live performances that carefully balance elements of fragile beauty with violent eruptions of static, electromagnetic interference and feedback. Adam has been performing and exhibiting throughout New Zealand and internationally since the late 1990s featuring at numerous festivals and exhibitions including Lines of Flight 2006, TASIE (Beijing) 2006, and S3D 2007. Alongside work as a sound artist, Bruce Russell is well known as a member of influential rock group the Dead C and free-noise pioneers A Handful of Dust. He processes and transforms sound through a veritable junkyard of analogue electronics and a variety of broadcast radio and other electromagnetic sources. Bruce has composed several radiophonic works for broadcast on ORF/Austrian National Radio’s Kunstradio show, ResonanceFM, and Radio New Zealand, as well as for exhibition in the MAAP (Multimedia Art Asia Pacific) Festival at the Powerhouse (Centre for the Live Arts), Brisbane, Australia. Co-curator of Cloudland, Zita Joyce is a lecturer in Communications at the University of Canterbury, New Zealand. She has recently completed a PhD thesis about the allocation of radio spectrum, and has a particular interest in the physical, political and cultural ‘space’ of wirelessness. Zita is also a trustee of Aotearoa Digital Arts.